Cauliflower is a surprisingly versatile vegetable. I often use it as a substitute for potatoes in a creamy mash or in a low carb pie topping. I also steam and blend cauliflower to bulk out pumpkin soup. More recently I experimented with cauliflower rice as part of a paleo paella dish (it worked). 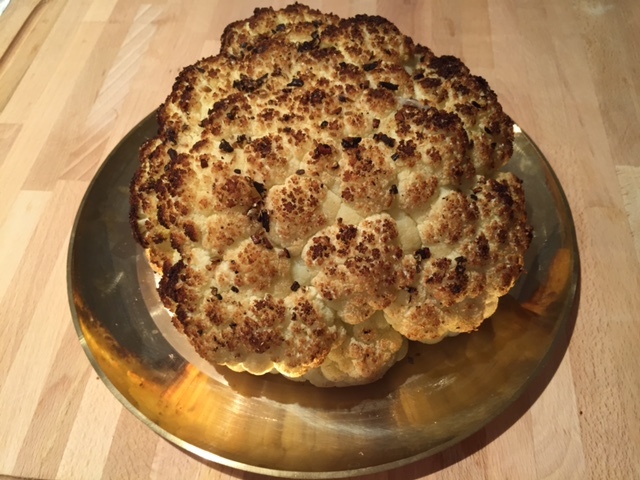 Ready for my next cauliflower challenge a Neil Perry recipe caught my eye – when one of my favourite Australian chefs boasts about “wow” factor whole roasted cauliflower I had to give it a go. 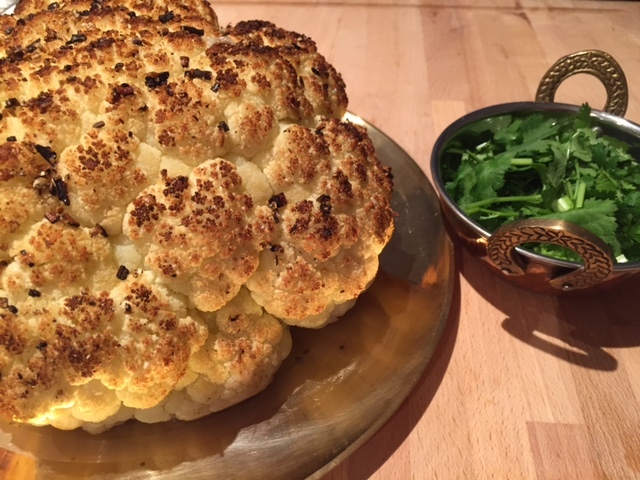 I followed Neil’s cooking technique but not his flavourings – because, armed with my latest fresh batch of home-made garam masala spice mix, I wanted to test Indian style roasted cauliflower. According to my Natural Wonderfoods book the most powerful health properties from cauliflower come from compounds that fuel and strengthen the liver during detoxification. Cauliflower is also high in vitamin C, folic acid and zinc, all of which play a role in boosting immunity. Note – instead of garam masala you can use a mix of cumin, coriander, cinnamon, nutmeg and black pepper. Prepare the cauliflower by removing the outer leaves and cutting the stalk so it will sit flat during cooking. Then wash it well under running water or by soaking the whole head in water for 5 minutes. Pre-heat the oven to 220C. Cut a cross into the base of the stalk of and place the cauliflower into a large lightly oiled baking dish. Drizzle 2 tbsp of the oil evenly over the cauliflower and season with ½ tsp salt. Pop into the oven. The cooking time depends on the size of the cauliflower but as a general guide it takes 50 minutes to 1 hour. Test whether it’s ready by inserting a knife – if it goes through smoothly it’s ready. Add the garam masala to the lemon juice and the remaining 1 tbsp oil. Whisk together and then massage this over the cooked cauliflower. Serve with fresh coriander as a side to a spicy curry or a tasty dahl. Tags: cauliflower, Indian, lemon, roasted, whole. Bookmark the permalink. Thanks Linda – yes I agree and whole roasting it seems to bring even more flavour…. Goodness this looks good! 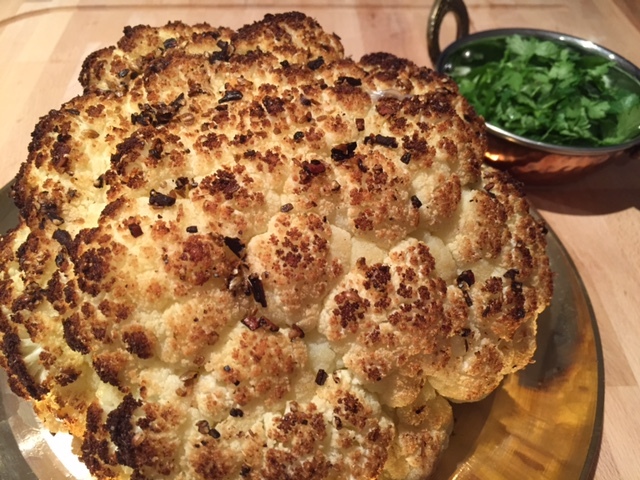 We’ve been eating lots of roasted cauli lately – even the kids love it. Thanks Hungry Mum – it’s going to be a regular on my week night meals – super easy to prepare! Hello! I am so glad I stumbled across your blog today. This looks delicious! 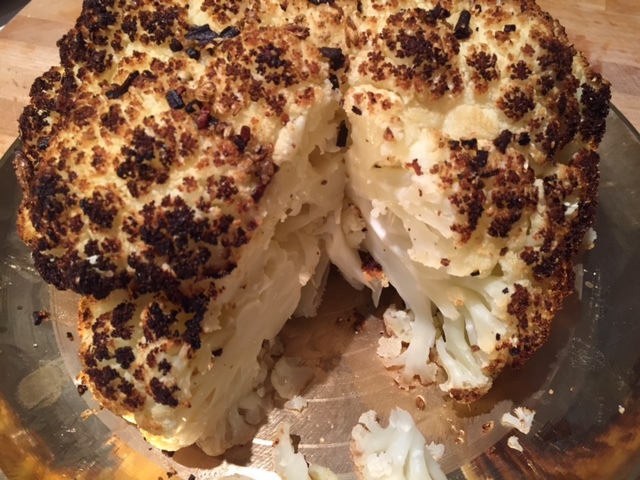 What a fun way to eat cauliflower! Aw thanks Dani – I hope to find time to give it a go…. Thanks Dimple – it is so good as a side to a good curry or dahl – I’m making it tonight with a Kerala prawn curry….Happy Christmas! 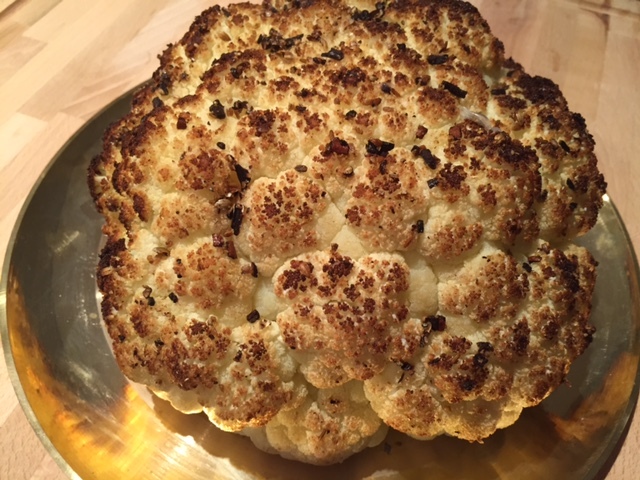 I totally agree with you – once you perfect roasted cauliflower there is no going back! I sometimes keep it simple omitting the garam masala and just using melon juice and salt….